Lijadora pulidora con potente motor de 1200 W y plato de soporte autoadherente de ø180 mm. Indicada para lijar, pulir y abrillantar superficies. Empuñadura cerrada para mayor control durante tareas de lijado y pulido. Botón de bloqueo para funcionamiento continuo y bloqueo del husillo. Acceso rápido para cambiar las escobillas de carbón fácilmente. Incluye plato de soporte autoadherente, disco de lija y funda pulidora. Vástago macho M14. Tamaño del plato de soporte: 180 mm. Velocidad sin carga: 800 - 3.500 min-1. This has to be the worst polisher I''ve ever come across. I''ve used it 4 times and every time I wonder why I bother. I don''t know if I have a faulty one or not but it is nearly unusable at times. It''s skips, jumps, speeds up, slows down. Jumps across the panels. It''s just horrible. I''m sorry I bought it. Would not recommend to any one. Gave it one star only because there''s no option to give it zero stars. This product is good value for the price. We bought this polisher to polish our sailboat, we do not intend to use it for heavy regular polishing. We use ours as and when necessary and it works a treat to keep the hull shine up to standard. I would recommend this polisher for the DIY market and those who like to do a good job. Does what it says it does very well. Build quality feels good for the price point. The unit is quite heavy though. Was worried about buying this compared to some expensive polishers but this is amazing for the money. There is no need to spend stupid money on something when silverline are just as good but at a fraction off the cost. Excellent polisher. gives great results every time. Have only used once so far but does what it’s supposed to,it’s quite light unlike some others that I have so easy to use. The variable speed is good as helps to get the correct affect on any surface. Great equipment! Light and easy to use cleaning and polishing my Jeanneau 645 motor cruiser. Will recommend to friends. The Silverline 1200w polisher is an awesome bit of kit. Well made and feels like a more expensive tool when using. I recommend this product very highly and well worth the 5 stars. Haven''t had time to actually use this tool yet but thought it might be worthwhile sharing my experiences on putting the tool together on receipt. I found the tool heavier than expected at 3kg and trying to assemble the front handle very difficult; the supplied bolts were extremely tight in the body threads and required some petroleum jelly and an extension tool on the supplied Allen key to try to ''tap'' the bolts into position. The machine was also quite noisy in operation. Don''t know what I really expected and can''t rate the tool fully until put into use - hence the 3 star rating. Well designed. Robust. Comfortable and safe in use. Going strong after several years use (polishing, sanding, surface cleaning with wire brush). Bought for sanding and buffing wooden worktops. Does the job and good value. Great product at a competitive price. Reassuring for the 3 year warranty. Very solid piece of equipment. Fiddly to fit handle but ok when done. Easy to use and change disks etc. This is a great polisher for the price. The soft start feature sets it apart from many other polishers, essential in preventing polish being flung all over the place when start. The detachable handle makes the polisher comfortable to hold and control. All in all i am very happy with the product, but if i had to pick fault i would like to have an extra metre in length on the power cord, the supplied 2m length is fine for average sized vehicles, but not quite long enough to reach the centre of the roof on larger vehicles. First rate piece of kit. With G30, did a wonderful job on my boat''s top-sides. What more can I say! The polisher is a BIG improvement over a previous one I used to detail my cars. It is easy to use and really shines. The large disk reduces the time spent shining. excellent value tics all the boxes well worth it! Good quality product! Very satisfied. An efficient machine at a reasonable price that does the job! I''ve used this polisher for a few years now and its still going strong. perfect for my boat hull and my car. Good value for money and does the job. I accidentally pushed the rotor lock button while it was on and broke it, but immediately went out and got another one they are such good value. I had my previous rotary machine polisher for about 7 years, so i thought i was due an upgrade seen as my last one did not disappoint i thought i would go for the same model only a new one. It did not disappoint. It''s a little smaller than my old one and even a little lighter. It''s also much much quieter. And if it performs like my old one then I''ll be really happy. 7 years and it never let me down. Infact it''s still going i have it to a friend who uses it regularly. amazing product and value.show car shine every time.10/10.100% brilliant.thanks silverline. Solid looking polisher. Yet to try it out on the boat but it starts up nicely, the slow start up is particularly nice and it changes speed well. This polisher is nicely weighted I used it for over six hours on paint correction and it handled it very well it could do with a longer power cable as the one supplied is about two metres shorter than what I am used to and on a larger vehicle a longer cable makes it easier to use and doesn''t get dragged over the freshly polished paint. Also a side handle option would be nice. Does the job , comfortable grip, with a good length electric cable, so far well worth the price. The reason I say I was pleased after all, was because the 1st polisher was faulty, the spindle lock did not work, this was returned without any fuss and a replacement polisher sent out the next day which worked fine. A good polisher, with a decent size mains lead on it, and not to heavy to use and well balanced, so I would recommend this polisher. Great tool just what I need to get my boat looking good. Das Gerät macht einen sehr guten Eindruck, es ist nicht zu schwer und liegt gut in der Hand. Für den Privaten Gebrauch, reicht es aus, schließlich muss man den günstigen Preis berücksichtigen! this is a brilliant product,i have used it on my 1991 ford fiesta''s paintwork,which was very dificult to get a good shine on the bonnet,after using the polisher with a cutting agent, the shine was back,it took no effort at all,as the machine is well balenced,and efortless to use,great product! Great quality polisher for a decent price, would recommend! The power trigger mechanism was faulty out of the box, with starting the machine being a problem. After using the machine with difficulty for 20 mins its almost impossible to get the trigger to start the machine. It''s covered under guarantee but postage isn''t, and as its quite heavy postage is expensive. I''d give it zero stars as its not fit for purpose. I''ve used numerous polishing machines over the years, including top brands. With a view to getting one for home use I thought I''d give this one a go in view of previous successful purchases from Silverline. It does everything expected of it, the speed control is good and even at low speed the torque remains sound. The dead man''s switch is tricky to get used to, but it''s a needed safety function so happy to work with that. Very much a two hand tool it''s proven reliable, robust, and if the truth be known the duty cycle far exceeds the intended DIY use. Utterly superb value for money. Excelent product at good price. what a brilliant buffer very good value for money . excellent machine. would highly recommend it for anyone who take pride in their car. great value product, brilliant for polishing your car with adjustable speed and easily changeable polishing heads used with polishing compound you can get a deep shine finish on older paintwork that has become dull over time or remove the orange peel effect on freshly painted bodywork. easily as good as the more expensive machines. overall very pleased with this polisher. Well balanced, easy to use piece of equipment. The additional handle and variable speed makes it ideal for the task of polishing, especially under the boat I was working on. It Sand! It Polishes! It''s still going strong after 2 years! Things go wrong, but ! service is everything. It is important that this polisher has a variable speed, the speed control does not function, took me a while to get a response from supplier, Now in the middle of an refurbishment, having already damaged the surface when the polisher burst into life, I have to return it, "for examination" no idea when it will return. Poor show. Brilliant as a polisher, leaves an incredibly shiny finish and the bonnet is good quality too, don''t use on maximum speed though as it would set fire to polish. Spot on polisher, The polisher is very easy to set up and use, Just the right wait so it can be used for longer periods without your arms dropping off, And with different heads it can be used for various tasks, A very good polisher, Just right for the jobs it is made for. Very impressive, it is used to polish my 5 cars on a regular basis, machine works very well with variable power excellent. I recently sprayed part of a car and the polisher was very affective at finishing and cutting the paint back. The head is easy to change and I would not hesitate to recommend the machine. It''s ok easy to use bought to polish my canal boat,but after 1 hour the lock button used for changing the polishing heads came apart, so I now use a spanner to change the heads except for that it''s a good tool. I would have given it a 4 star but with the problem I''ve had it''s only 2 star. Excellent value for money. Has the power to do the job. 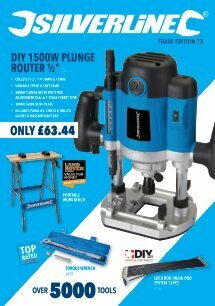 Just one in a great line up of reasonably priced tools from SilverLine. Brilliant polisher and sander with the variable speed used it after reviewing how on utube to slowly sand and polish the yellowing on my merc headlights bringing them back to look like new after it failed the MOT, and it passed. Bought one to buff up my old airstream – perfect. Came with spare elec contacts too though I''ve lost them already. Does this product have a lock-on switch? Does this model have variable speed? Yes, this model does have variable speed. Where can I buy extra attachments? Este producto Silverline Lijadora pulidora 180 mm, 1200 W dispone de 30 días de garantía desde la fecha de compra contra defectos de fabricación y materiales defectuosos. Registre su producto online para extender el periodo de garantía 3 años. Todas las piezas defectuosas serán reparadas de forma gratuita.